The floods that hit parts of North Korea in recent weeks have killed 169 people and left 400 missing, the state news agency says, sharply revising earlier casualty figures. The floods and heavy rain in late June and July have also made more than 212,000 people homeless, it says. Some 65,000 hectares (160,000 acres) of cropland were affected. The UN’s World Food Programme (WFP) says it is sending emergency food aid to North Korea after it asked for aid. Official media had previously reported 119 deaths in the floods. On Friday, the WFP said the initial food assistance would provide flood victims with 400 g (14 oz) of maize per day for two weeks, but it did not say when the food would arrive. 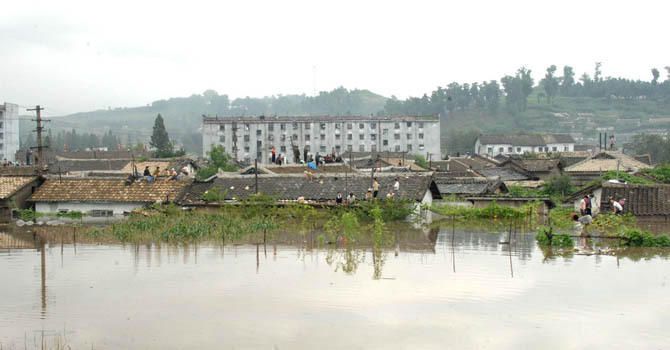 UN officials in Pyongyang who visited flood-hit parts of the country to assess damage said the need for aid was urgent. More than 8,600 houses were destroyed and another 43,770 swamped, along with some 1,400 schools, factories and healthcare facilities, according to the state news agency. Residents in these areas need of food supplies, as well as clean water, as wells have been contaminated by sewage during the floods. North Korea relies on food aid because it cannot grow enough food to feed its people. Famine in the mid-1990s is believed to have killed hundreds of thousands of people. A UN report released last month estimated that two-thirds of North Korea’s 24 million population suffer from a chronic shortage of food.